Cannily pitched to well-intentioned Beeb execs as a time-travel show that might help young viewers with their history homework, by Doctor Who’s second story the Daleks were on screen and evil icons had been born. Still discovering the role, First Doctor Hartnell was stern and professorial, and Second Troughton added a bit of madcap clowning to the mix. Stranded on Earth by a plot McGuffin for Pertwee’s arrival, the 70s saw the show rebrand as an Avengers-style sci-fi thriller. Best companion: Brigadier Alistair Lethbridge-Stewart (Nicholas Courtney), plummy old-school regimental type who first appeared during Troughton’s era and would continue to pop up until Courtney’s death in 2011. The antithesis of the wayward Doctor’s apparent lack of discipline. Best story: Fearsome parallel-universe goings-on in ‘Inferno’ (1970), the point at which things got really scary. Delia Derbyshire’s proto-electronic soundtrack helped. Undoubtedly Who’s prime decade until its most recent outings: excellent turns by the steely and daring Pertwee and the more youthful and human Davison (cricket obsession and celery stick in his lapel notwithstanding) bookended the ultimate icon of Old Who, boggle-eyed extraterrestrial Tom Baker. Great monsters, fine acting and weird concepts drove the show to new heights. Best companion: Sarah Jane Smith (Elisabeth Sladen). So great she got her own show in the 2000s. Best story: ‘City of Death’ (1979), mainly for the wicked injection of humour courtesy of then script editor Douglas Adams. After a few more choice Davison stories, the miserable Colin Baker years and Sylvester McCoy’s eye-catching but underserved performance (witness 1987’s miserable, holiday camp-set ‘Delta and the Bannermen’) gave way to the show’s ignominious cancellation in 1989. Even those of us unlucky enough to start watching during this era would say it was probably the right decision. Best companion: American schoolboy-crush-magnet Peri (played by Surrey’s Nicola Bryant and her unsteady accent). Best story: ‘The Caves of Androzani’ (1984), which many fans say is the best ever. Dark and brutal by Who’s standards, it was also Davison’s last regular appearance. The wilderness years were broken by Paul McGann’s single appearance in the US co-produced 1996 television movie, notable for seeing McCoy’s Seventh Doctor taken out in a drive-by shooting and a touch of, err, Hollywood glamour courtesy of Eric ‘DTV’ Roberts as The Master. The period’s high was actually on the printed page, with a series of Who novels continuing the story, with future series writers Gareth Roberts, Mark Gatiss and Russell T Davies all represented. Best companion: With only the movie to choose from it has to be Grace (Daphne Ashbrook). Not as good an American companion as Peri. Russell T Davies’ excellent 2005 revival has become the blueprint for a new generation of British sci-fi television, and Steven Moffat’s 2010 takeover hasn’t slowed things down. Tennant and Smith have more fans, but the underrated and prematurely departing Christopher Eccleston set the benchmark. Peter Capaldi joins at Christmas. 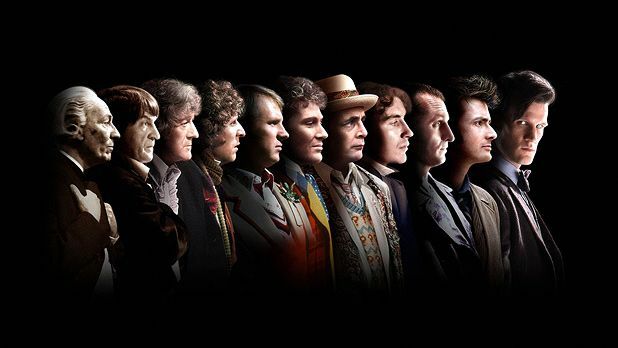 Doctors: Christopher Eccleston, David Tennant, Matt Smith, Peter Capaldi. John Hurt, possibly? Best companion: Ending up on the street by way of Sylvia Young, Rose (Billie Piper) was the original and best of a new generation of companions. Best story: ‘The Doctor’s Wife’ (2011): Neil Gaiman’s debut on the show was boundlessly inventive and genuinely creepy. The Day of the Doctor, BBC One, Sat 23 Nov.
Episodes of the stalwart series. Fiftieth anniversary screening, in full 3D, taking place across the nation in celebration of the good doctor.